The sun through the smoke. Yes, that is the sun and not the moon. The first big wildfires of the season broke out here yesterday. The Panther and Cedar fires were burn a ways to the South and just a few miles apart. With a strong dry North wind they made a good run. A huge column of smoke stretched over the valley and the sun was obscurred last night when I took these pictures. Hopefully the firefighters made good progress last night when the winds died down. 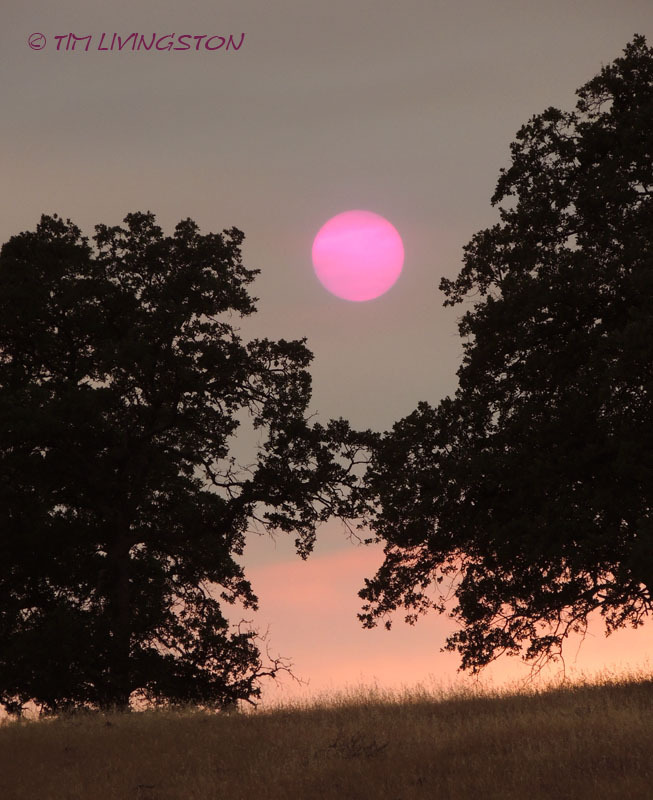 Sun through the smoke and oaks. May first and we are already seeing forest fires. Dry down is well underway here. This doesn’t bode well for this Summer’s fire season. Here we go again. This entry was posted in Musings, Wildfire and tagged forest, Forester Artist, photography, smoke, wildfire by foresterartist. Bookmark the permalink. That is not good! Some how saying I like this post doesn’t seem right. We alway have to find the silver lining. Positive thinking! I appreciate that. I’ve been worrying that it would be an early fire season this year. The grass on the hills behind our home here in the East Bay have become dry far too early. Hope these fires in Napa are contained quickly. It is so dry out there that fire season will be extra long, unfortunately. There is a fire in Southern California that is already over 3,000 acre. Brace yourself it is going to be a bumpy ride. You had a fire yesterday too, didn’t you. Great colors and tone. While we hate to see fires break out, it certainly makes for dramatic photographs! Yes, those are often our most colorful sunsets. I know people here in Minnesota may be a bit cranky that we still have patches of snow but it sure has delayed the spring fire season. There has to be a happy medium between California and Minnesota! this is pure poetry, beautiful post! This is really bad news for humans and everything connected to the forests. I agree, it is going to be a tough year. It’s interesting how something so awful could be so beautiful! True, our most beautiful sunsets come during fire season. Beautiful and scary at the same time, I do hope the firefighters will win! Hi Divya. No your camera was working right! It is amazing the colors nature can produce. Sorry for my ignorance, but how do these fires break out? And why in this season? We normally have very little rainfall at all from June through September. Usually, the high fire activity get going in July, August and September. This year it dried up much earlier. We are facing high fire danger from May through September or even November. The fire can start from all kinds of things; old burn piles, lightening, arson, kids and matches and so on. Wildfire is something we live with here every Summer only some years are worse then others. This year has all the makings of a dramatically bad fire season. Terrible….haunting image….I hope the season doesn’t get as bad as they’re predicting. Hi Suzanne, my experiece is telling me to prepare for a rough year. uggh! My son has been hired on in Montana to work with the fire crews…cutting for them if need be….Mama nerves are in high gear! No doubt, but I’m sure he knows what he’s doing. sad but beautiful… does it go together…? Often it does I think. Oh Tim we have just seen some pretty dramatic footage just now on the BBC news of the wildfires in California …. terrible .. fingers crossed the winds will die down and some sort of order and control can come asap. We have been suffering terrible winds for some time. One expert reported we had our windiest April since 1953. We are ready for calm. The firefighters won’t get control of anything until the winds settle. The big fire in SoCal will burn all the way to the Pacific if it hasn’t already. Thanks for you crossed fingers! Beautiful images. HOpe some rain comes your way very soon. We came home last night to fire engines at the end of our road. They put the fire out. It was about 3/4 mile away. Power was out all night. An eerie shot, I’ve seen similar sights in Melbourne but the sky turned red during a bad bushfire. I hope you get lots of rain soon and very little wind. Thanks Jennifer. I know you folks deal with these kinds of fires too. Our rainy season came to an early end. We may not see heavy rain until November. We came home to fire engines at the end of our road last night. They put the fire out quickly, but we lost power all night. Such dramatic photos and do hope the situation eases soon. Thank you Patti. We do too, but it is the beginning of our fire season so I think it will just get worse. Sorry to hear about the wildfires but the photo is beautiful! Thanks Bob. I guess it is just that time of year. I hesitate to say how very beautiful these photos are, knowing that the fire is what made them so. Hope it is well under control, Tim. As I look outside this morning the wind is calm for the first in a week. It will be a good day for the firefighters. The pictures are beautiful. But I hate that the reason they are so beautifully eerie is because of fires! Hoping for rain to come your way over the summer so that it’s not dry enough for fires!!! We actually had a little thundershower today. We could use a big one. Here’s to hoping. Thanks Kira. Stunning. Vividly amazing, a beautiful scene. Thank you very much Marylin. So amazing pictures, I suppose you use a photo filter for the sun.. it’s just great. Those fires are terrible, they told about it in French television and i wondered if it was in your forest! Thank you. No filter only the smoke. It rained here yesterday and I think they have the fires nearly all contained. Happy to hear about the good-news of rain…beautiful photo!! The color the smoke creates is striking. Thanks Cindy. The smoke does make for amazing sunsets and sunrises. The images are surreal – I know that’s what everyone says, but they are! Best be prepared for a long summer. A long Summer indeed. The grass and fields look like July. Unusual colors, indeed, but WHAT does that air contain? Really? What are you really breathing into your lungs? It was smoke from a timber fire. The smoke was at high altitude and to the West, so our air quality was still good. During bad wildfire years we will have long periods of very bad air quality when big fire are burning locally. I’m sorry about the wildfires, Tim. Is it the smoke that gives the beautiful colors? The fires have calmed down for the time being. 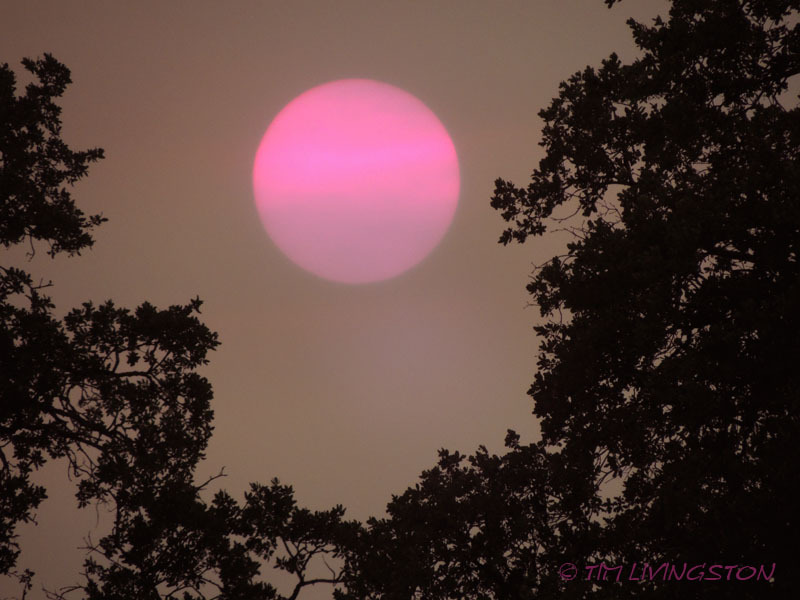 It is true that when we have big fires in Northern California that we get some of our most spectacular sunsets. The fires are bad, but we may as well enjoy the sunsets. What else can we do. Strangely beautiful. Hope the firefighters won last night. Thank you. Fortunately, this post was for a while back so the fires are all out now.